The diesel roadster: Minimal consumption, maximum prestige and a fine touch of sportiness. 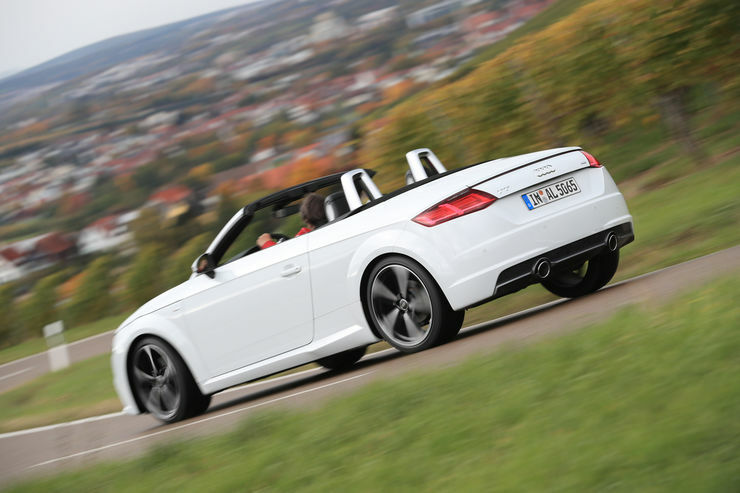 This the recipe for the Audi TT Roadster 2.0 TDI and Mercedes SLC 250 d, one that can not fully unfold its benefits – for very different reasons. FIRST TEST via auto-motor-und-sport.de. Quality is already a very complex parameter. For example, a great engine alone does not make a good car and vice-versa. Say: It’s not just about the components, but the package to match the way how these components work together, and the Mercedes SLC illustrates this wonderfully – in every respect. The Mercedes SLC 250 d is neither fish nor flesh, but instead of attempting to reconcile both, he simply remains a vegetable and stands by it. Because the 2.1-liter diesel engine – homemade, by the way, no Renault adoption – is literally tailor-made for a posh roadster. With its beefy torque it fits the bill, rather dominated by sovereignty than by ambition. The result is a harmony between power development and handling, which ultimately can be billed as charm. So far the good news. The bad: Unfortunately – from the point of view of the Mercedes – we must understand the quality in the sporting context and by no means is this a true sports car. For the Audi TT, the same conditions apply, but they are quite different. For the time being, it is a roadster as out of the picture book: manual shift instead of automatic, fabric hood instead of metal top, more compact than the SLC, more direct on the road and therefore also significantly more energetic in the implementation and execution of driving commands. But in contrast to the Mercedes, the TDI in the Audi clearly plays the second violin. The two-liter diesel is certainly not a lemon, because it revs decently, pushes good and is even a tick more eager than the 250 d. However, the cross-dynamic limits of the TT are accentuated with the 184 hp and 380 Nm engine. But before we go into the details and see why the more unbalanced car is so much better in our test in the end, we have to clarify a few basic things about this still quite young and quite special vehicle class. The connection between roadster and diesel engine is nothing more than the attempt to bring together reason and pleasure – two attributes, which are excluded from the outset. The regret: the satisfaction of low consumption is, in our opinion, actually never large enough to offset the inconveniences. I mean things like the stubborn acoustics or the rev counts, which are noticeably slimmer than in the vast majority of turbo-diesels. The question is not this time, whether one is willing to compromise. 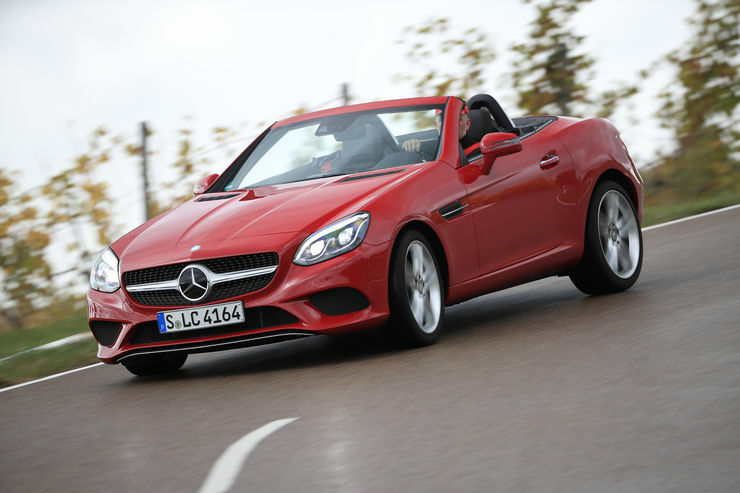 And in the case of the Mercedes SLC 250 d it seems as if it were the more tolerable. 500 Nm appear in his identity card. That is more torque than that of a BMW M2. Well, thrust exists, but as powerful as the number perhaps suggests it is, the SLC never accomplishes. Nevertheless, the 120 Nm less torque offered by the Audi is nothing to sneeze at, affecting the performance in the sprint as well as in the elasticity, which is synonymous with the fact that the Mercedes’s power with the nine-speed automatic is staggered shorter than the TT with only six gears. The fact that the race is still very tight is due to the weight. The Audi TT Roadster 2.0 TDI weighs 1.432 kilos in the test and the Benz tips the scales at 1,652 kilos – and this handicap grinds the SLC 250 d of course. In the sprint it is attached to him as a foot-restraint on the rear axle, in the slalom it allies with the ESP, in order to work together against the agility, and also on the country roads it is always noticeable. Viewed in isolation, the Mercedes SLC 250 d is certainly not a boring car, but one striving for a sporty overall impression. The adaptive shock absorbers, which, in addition to the extremely pleasant comfort they offer, also pen an amazingly low-priced sporting proposition. What does not really help is the presence of TT, vastly superior in terms of handling. The driving dynamics differ dramatically. After all, the biggest problem is a fundamental one, namely, the fact that the requirements of a race course and the characteristics of a diesel engine are actually contrary. A fast round around a track requires great hardware. This means that you always move at the limit of the landing gear, the brake, but also at the limit of the engine. Now, a diesel presses rather than rotates, so that one always hangs down on the side of the torque band. However – and with that we are at the point – a leisurely performance has not stopped us from being fast in corners. And the Audi does this in an impressive manner. Without hesitation, it turns around, pulls himself out before the following straight line. The electronics never let the Benz out of sight. The ESP does not miss anything, with every change of direction it brings its sensors to the game, and the larger the steering movement, the more panickily it engages. The whole thing goes so far that the optional sports brake get hot after only one and a half rounds before loud automatic interventions. So in the end it is a little duel of the opportunities. The TT can be much more than its TDI engine, the SLC also so little because the electronics cut its wings. Neither car is truly sporty, but nevertheless, the Audi works more harmoniously. The problem of these two cars is not in the combination of a diesel engine and a roadster. The TT would require more steam, a stronger motor, one like the Bi-TDI with 240 hp. With the SLC, the solution would be even closer. It has power as well as signs of agility thanks to its RWD format, but it needs to liberate itself from the paranoid ESP. The stylish CLA Shooting Brake vs the classical C-Class Estate. Which is best?